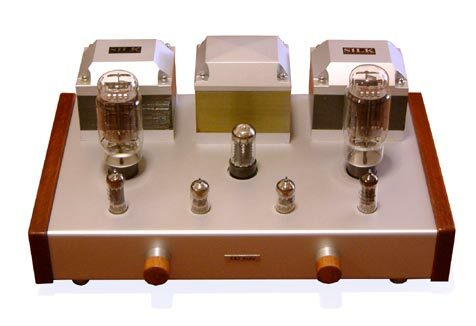 20 watts pure class A Single-Ended with special directly heated triode from KR, KR842 could deliver higher power output with very low distortion, thus smooth and linear sound could be produced even at high level. We use special arrangement by separating power supply between driving stage and power stage. Using 5AR4 soft start rectifier to feed 20 Henry choke loaded power supply for the driving stage proves stability and better sound image. KR842VHD tubes are feed by raw power from heavily filter choke loaded filter derived from ultra-fast recovery diode rectifiers that are more stable under very high load demanding and high voltage potential. The final sound is very musical and powerful that easily drive small bookshelf loudspeaker into realistic sound field level.